Sweet Winter Black by TrendStyle is sold as a dress but also looks fabulous worn it as a top paired with black pants or leggings. The hat and fingerless gloves shown are also included. You'll find it to the right and near the front of the store. You'll find it at the store entrance. The gift includes the dress and boots. Tights not included. 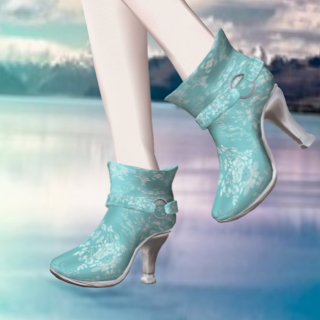 This is my favorite color and I know I'll be wearing these boots with so many other things. Check out the cute winter subscription gifts while you're there. Those are to the left as you enter.